This post I wrote as a draft three years ago… the island will have its new countertop Tuesday and I’ll update with photos. So this is a blast from the past. We decided to go a different direction but I still love these choices so check them out. Redoing the kitchen included updating the kitchen island as part of the complete kitchen renovation. The original cabinet is a three drawer and three door cabinet sitting on the cement foundation. Because there is no tile underneath, and we don’t plan on re-tiling the kitchen, the renovation has to take that factor into account. The island’s electrical box will also be moved to improve aesthetics. From the photos, the island looks just like a box, nothing special. 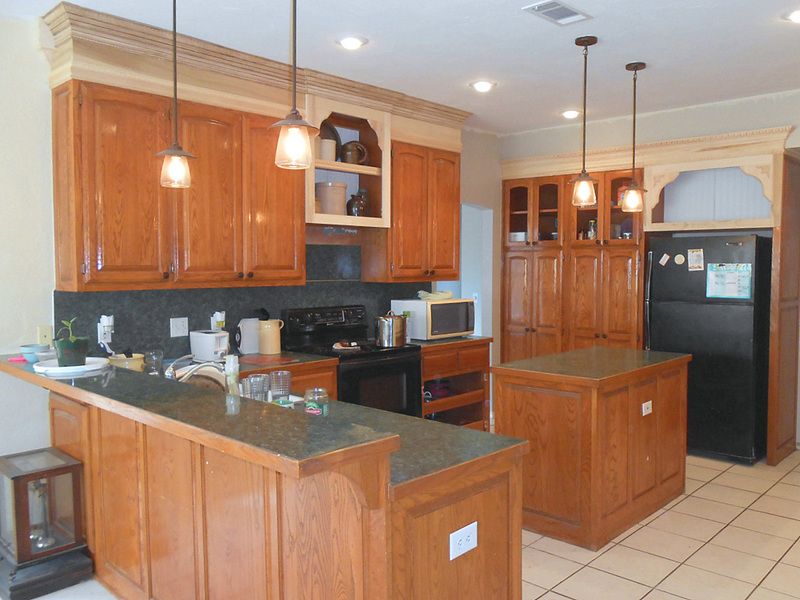 It also blends in with the other cabinetry and just looks like more cabinetry. Fashion wise, today’s kitchen islands look more and more like furniture, preferably an “antique” that has been added to the kitchen either before or after it’s construction. BTW changing your current island or installing a new one, check your code. There are specifics about how far the island can be placed from the stove, fridge, and dishwasher, as well as the width of walkways through the kitchen. You don’t want to change your island, only to find out you can’t remove your stove! The blue island has awesome cornerlegs and I really like how the base molding is done. The only fault is the countertop should have been thicker too for better proportion. I like the proportion of the upper with the lower, shorter leg on this table from Osbornewood.com. I also like the base shelf being completely open. Our design would need the baseboard to go all the way to the floor to conceal the lack of tile. Another design with the bottom completely open from RealSimple.com. I think the advantage this design would make the kitchen appear larger. My only problem is how this space would be used for storage and is it realistic for how we use storage in our kitchen? After reviewing what I liked and why, I know I want to keep the drawers. They are way useful and the kitchen runs a bit short on drawers. Another choice for storage would be baskets for holding onions, garlic, potatoes and other dry pantry items and/or vegetables. I like this idea as it would provide texture and country to the kitchen without going overboard. Our original plan was this, which I love and may use one day however, for this house we completely went a different direction (and I’ll post later about why). I’ve loved this vintage sideboard for all its ornate carving and have meant for some time to convert it but time escaped me. No more! Originally, this sideboard was a bit too tall to be comfortable to watch television from the distance of tv-to-sofa that we have in our family room. We lowered it by removing the two front drawers and bringing it down to a height of about 30 inches tall. Cutting it down went pretty easily because this older piece of furniture is made with tongue and groove, as well as real wood. Tongue and groove allows you to remove the side pieces and put them back together like a puzzle. I think by removing the drawers, it shows off the remaining carvings on the front of the cabinet better. These photos have the front cabinet doors off (I’ll show those later). The sides of this cabinet were damaged. One side had too much water warping to be saved, so we replaced that with a new piece of wood. Because I don’t plan on staining but painting this piece, it didn’t matter about matching wood grains etc… but if it did, you can buy veneer pieces you can glue over a lower grade board (i.e. plywood). We also took a piece of the molding removed from the discarded top portion and used it at the sides; that is the grooved horizontal board you see here at the top of the unfinished panel. By reusing elements from the discard pile it helps to tie the new with the old. The other side had a bit of water damage to the veneer. This often happens when this pieces are stored away in the attic, basement, garage, storage shed, etc.. and veneer can also splinter off due to the extreme changes in temperature and humidity. A veneer repair can be approached in different ways. In this instance, since I know I’m painting the piece and not staining, I took the easy way out which was using wood filler and sanding it smooth. Not especially pretty but it’s all going to be covered with paint. Another method would be using Bondo which is a car repair product that also can be painted but not stained. I would have preferred that because I like how smooth it spreads but we didn’t have any on hand and I wasn’t going to buy a quart of it for such a small job (it is rather expensive). If you were going with a stain, repairing it with another piece of veneer would be the way to go. Another change I made was putting a kickboard across the front and the sides of the television cabinet (former sideboard). Why? Because in its former incarnation this piece had become a home for dust bunnies when it was left open. With these kickboards, I can run the vacuum cleaner right up to the edge and don’t have to get on my knees to dust out from underneath this piece of furniture. We were able to reuse wood from the part we had discarded so no lumber costs for this change! Yay! This piece also had an interior shelf which we removed. Since we plan on stacking boxes within, I wanted nothing that I had to work around height wise. It will also make it easier to get items in an out of this cabinet. Because of the ornate carving I knew this piece would be time consuming to paint by hand, and I’ve been wanting to buy a paint sprayer for some time so picked up this HomeRight C800766 along with some accessories: such as an extra paint canister, rapid clean hose, and paint cone strainers. 1.) Sprayers can spray EVERYWHERE. You will get overflow spray around the item you are spraying even if you use plastic drop cloths. So be generous with your plastic dropsheets! 2.) Make sure the humidity is right for your paint! We had 80% humidity today and a 30% chance of rain on Monday. So this project is waiting for Tuesday or Wednesday which is supposed to be sunny and dry here. If you paint during the wrong temperatures or humidity for your paint it will not cover correctly and you’ll be stripping your project or just having to live with a sloppy bubbly, alligatored paint job. 3.) Commercial sprayers use more paint then brush rolling or painting with a brush (although after I used this one, it actually used less so see my other blog posts about the process). However, what you get in waste of paint you gain in time and effort. It’s up to you what you prefer. For me, I also like the very even and smooth coat coverage. I am doing the television cabinet with the sprayer before trying it on my king sized, four poster bed – both of which I want a very smooth finish on. Both have carvings and details that would be challenging and very time consuming if painting by brush or roller. 4.) Experiment with holding your sprayer. This one works best for items that can be vertical (i.e. doors, cabinets, large flat surfaces etc…) vs. ceilings or floors. Experiment with the trigger pressure on the gun. All this plays into the type of job you get. Sprayers take some getting used too – they are not as easy as they may seem and you need to put some time into figuring it out before doing that perfect job. 5.) Clean your equipment! When the nozzle gets jammed because you didn’t clean your equipment or because you didn’t thin your paint you have only yourself to blame. I’ll be straining my paint and then thinning it. Hopefully, I’ll be posting part 2 in the middle of the week when the weather is best for the job! Well here I am again! You probably thought I was gone for good! hahaha no, but I have been busy and need to update the blog. First, I’m changing the blog name to my own domain: FrontPorchCozy which was a plan of mine about 2 years ago. The new blog has NO ADS. Yep, there will NEVER BE ADS HERE. So you don’t have to wade through a bunch of damn popups and crap that you see on these other decorating and remodeling blogs. Can’t stand ads and at this point this blog remains a PERSONAL project. A. Downsizing. We, like many in the U.S. are trying to live within a limited budget especially as we are looking at retirement in about 15 years. We have a bigger goal of saving money by cutting expenses and improving our quality of life. This means reducing the big house with the big mortgage to reduce stress. B. Travel. We are going to be looking at a lot of travel models that would fit what we want to do in order to increase our income: buying property that we will sublet out for vacationers. With that in mind, you’ll be seeing some videos and thoughts on different places we have visited and what worked for us and what didn’t as a traveler. Most, if not all, of this will be focused on small homes, cabins, and unique getaways such as glampers or alternative built homes. C. Building and Remodeling. We will continue to wrap up work on the Tulsa House with the goal to sell it, while we explore other ways to build a new home with methods like Cob or Cordwood, using alternative energy like Solar. I have a lot of projects I need to catch you up on in terms of photos and descriptions, which I’ll be getting too over the next month as I have time. So while this blog will probably never be a daily blog or maybe not even weekly, I will be posting some neat stuff that I hope you enjoy. Meanwhile, you can catch more action over at our Facebook page Front Porch Cozy and at our Pinterest page. Wow! It’s been a year since I posted! So I need to play catch up with what we got done on the house. One reason I haven’t been posting here is that lack of money kept us from getting much done on the house. Combine that with lack of time and you get a whole lot of lack of motivation. However, come December, husband took time off of work so we got a lot of the little jobs that had been sitting around done and we are back to moving forward again. 1.) The Termite team came and sprayed. We had some damage on the front porch from these bugs and that needed to be treated. Once that got done, the wood siding came off, the plywood backing behind got replaced and new exterior boards put back on. We got a quote for $600 to do this; husband got it done for less then $40. Woohoo! 2.) We had two windows giving us troubles. One had a crack and the other had lost the seal so was getting moisture between the panes. This we did contract out for to have the glass replaced. Good as new. About $400 which was cheaper then I expected. If we could afford it, I’d replace all the windows with new but that isn’t happening. 3.) Front door latch which was brass was being cranky due to being worn out; I mean it was 20+ years old! That got replaced with a brush nickel pewter colored latch which looks a lot better with the black door and gray house paint. I’ll be repainting the door a fresh coat of black come summer. 5.) The Garage Door got some magnet faux hinges on it as an upgrade. $45. 6.) Our walk in pantry got a fresh facelift. Everything was dragged out, the ceiling repainted, the walls repainted, the shelving repainted and a couple of the shelves up high got cut back in depth (these were installed over 2 decades ago by us when we had specialty items that needed a deep shelf but the deep shelf cut back some of the light). Because food items in the pantry can stain the shelves (an onion had really done a number on one shelf! ), those shelves are now lined with clear, ribbed shelf liner from Bed, Bath and Beyond – so no I’m not repainting these again! Ha! I’m still working on that pantry (buying more food containers, putting in a built in bin etc..) but I’ll do a reveal when we are done. 7.) The single large recessed light in the hallway to the laundry room also got replaced with two halogen recessed lights, the short ceiling replastered and repainted. 8.) Most of the winter centered around the Kitchen. Originally, the house had 7 recessed lights that were the old style, large recessed can. They never provided enough even light in the kitchen and especially in winter, gave a lot of shadows and were constantly burning out. Husband replaced and rewired for 16 new recessed Halogen lights so they now match in style with the lights he put into the adjoining family room. They provide a lot of lovely light and give far more illumination to the kitchen area. However, this was a massive job. Not only were the new lights an investment ($265 from Home Depot which had a better price then Lowes), but the ceiling had to have drywall patches put in, then the entire surface was replastered, and all of it repainted. Instead of using flat white wall paint which didn’t look so great against the creamy white cabinetry, we went with the wall color at 50% lighter which worked great as we have 10′ tall ceilings in there. Working above your head is no fun! However, we are very lucky husband knows electrical because to have contracted this job out would have been well over $1,500 I’m sure as wiring for one outlet in the garage for husband’s pottery kiln was $300! 10.) The Kitchen Shelf unit FINALLY got painted. After debating again and again what I was going to do with the colors in the kitchen, I found a $5 gallon of paint at Lowes at closeout. I thought it would just be the undercolor (with a topcoat of cranberry red) but once it went on we both loved it so much we decided to go with it. It got a glaze of black on top but is not distressed. I’ll be doing a reveal of that soon too but I’m waiting on the countertop. 11.) We first painted the Island with the same color as the Kitchen Shelf as a test. But once again, when it went on we really loved it as it provided a beautiful contrast against the cream white cabinetry. It made us completely rethink our plans which was to rebuild the island from the ground up. Rebuilding the entire island would take quite a chunk of change, and we now know that in 3 years or less the house will be on the market – so was it worth it? Nope! We will be redoing the island instead with different types of drawers. I’ll be posting about that in the near future too. 12.) Which brings us back to the Kitchen cabinetry that I did in Ce Ce Caldwell’s Chalk paint (the same problem would have happened with Annie Sloan) and topped with wax. A BIG reason I haven’t posted in this house blog is that project was a disaster I was not happy about at ALL. Wax in no way will protect kitchen cabinets. And what to do about a protective coat when everything I know yellows when it is on top of white paint? I felt like house designer failure and it took me a long time (as you can tell from my blog posts) to feel like I wanted to tackle this problem again. I even debated about repainting all the cabinetry AGAIN or calling in an expert to fix the problem. However, after doing a lot of research I’ve decided to go with Protect by Velvet Finishes. I’ll be cleaning up the chalk paint on there now, removing the wax that remains and going with Protect over the cabinet surfaces. Hopefully, this will fix the problem that I’ve been wrestling with for two years! If I have a recommendation for you is don’t go with Chalk Paint in the Kitchen and if you do, use a medium to dark color so you can glaze and protect it with a top coat that won’t yellow over white. So while yes, I’ll be posting again, it will not be on a very regular basis – only as projects get wrapped up or if there is one that I think is interesting enough you might want to know the process. See you soon! Curtains are making a design comeback. I love them! Not only are they a great way to keep the heat in during the winter, and the heat of the sun out during the summer, but they are a great design element! They come in so many colors and variations. You can change them when you grow tired and want something different! 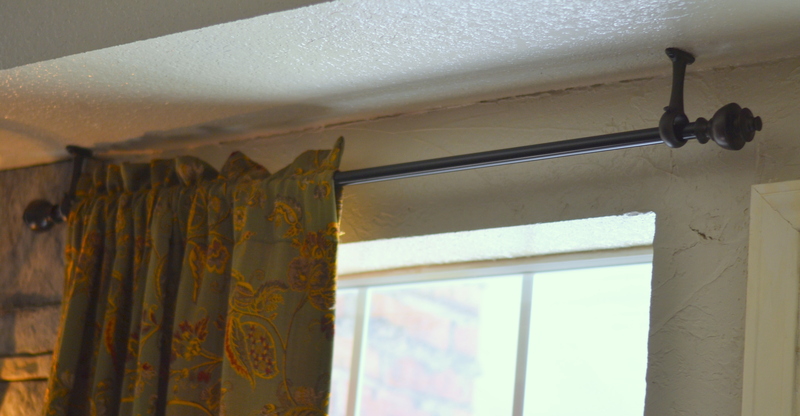 These curtains were original to my previous design and were bought at Lowes so its great to recycle and safe money. They are unlined (I prefer lined) but the color worked with what I found in my other furniture – creams, golds, burgundy and green. We have windows on either side of our fireplace. The problem is when the house was built, the designer made the windows too large for the space (we have a sofit that holds the AC/HVAC that runs along the perimeter of the ceiling) so the edge of wall-to-window space does not allow any room for a traditional curtain rod with a finial. I went with hangers that attach to the ceiling. This helped me save space because I wanted the curtains to slide over and hide the left and right vertical lines of the window. 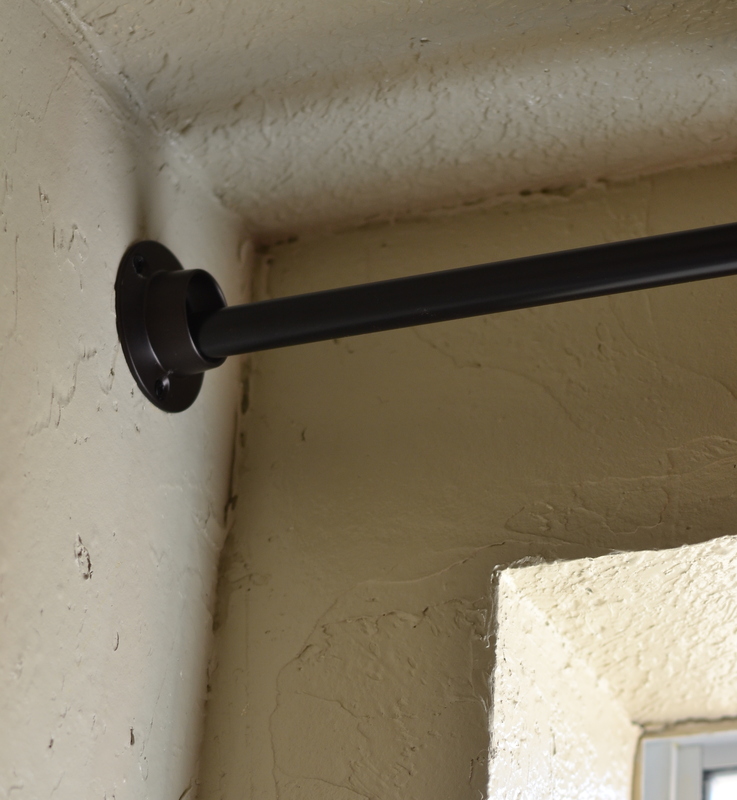 On the tightest corner, I mounted a bracket, from the closet section of the hardware store, on the wall to fit the rod into. There would not have been room to have a finial here with a all mounted bracket and have the curtain actually cover the edge of the window frame. Because of the color palette in this room, I wanted a rubbed bronze (brown) look and the finial will eventually match in design with the ceiling fan I’ve selected for this room. 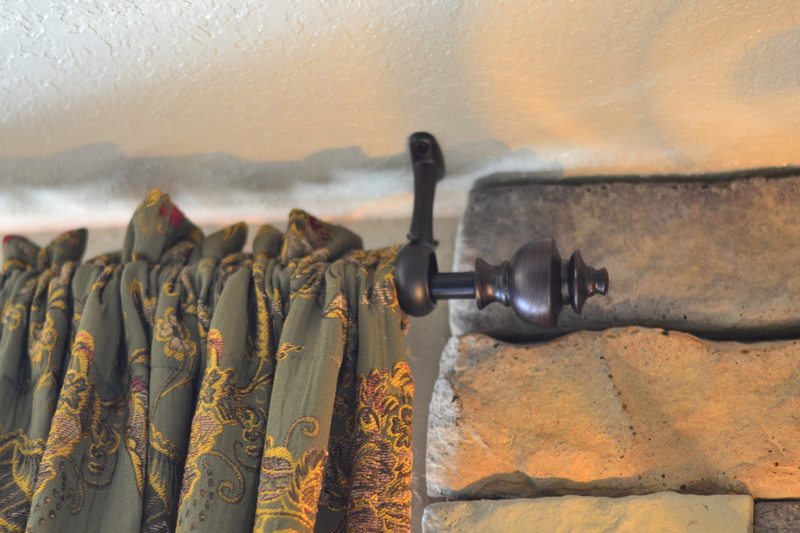 Mounting the curtain rod itself is a little tricky – I needed to make sure that it would hang my curtains to cover the edge of the window but the finials and rod had to be mounted away from the wall to allow the projection of the stone on the fireplace space. Here you can see how the finials overlap the fireplace – again, there is not enough room with how the original structure was built to allow a traditional curtain hanging. However, I love how this turned out – gives a very nice cottage, homey feel to the room! Eventually, I will be layering blinds behind these to provide even better insulation. This room windows face west so we get some hot sun and we also get some north wind, so windows really help me in providing physical comfort in this most used room in the house – the family room/den. Years ago we had extended one wall between kitchen and living room, and never got the plaster texture right. In this remodel, we replastered all the room walls with texture (took about three boxes, $100). The ceiling and walls are painted in the Rock color that I am using throughout the downstairs of the house which stylistically makes the different rooms feel united and bigger (it used about 4 gallons of paint if you include the ceiling, sofit and walls, approximately $200). Redid the floorplan layout so the television is hidden from view when you enter the room.